Seaton Delaval Hall is a Grade I listed country house in Northumberland, England. 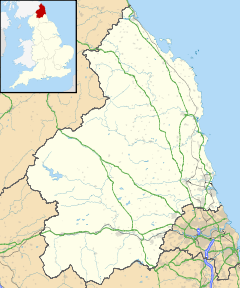 It is near the coast just north of Newcastle upon Tyne. Located between Seaton Sluice and Seaton Delaval, it was designed by Sir John Vanbrugh in 1718 for Admiral George Delaval; it is now owned by the National Trust. Seaton Delaval Hall was recently closed to visitors on account of building work. It re-opened on Saturday 16 February 2019, from Thursdays to Sundays only. Since completion of the house in 1728, it has had an unfortunate history. Neither architect nor patron lived to see its completion; it then passed through a succession of heirs, being lived in only intermittently. Most damagingly of all, in 1822 the central block was gutted by fire, and has remained an empty shell ever since. The 18th-century gardens of the hall are Grade II* listed on the Register of Historic Parks and Gardens. The Delaval family had owned the estate since the time of the Norman conquest. Admiral George Delaval purchased the estate from an impoverished kinsman, Sir John Delaval in 1717. George Delaval had made his fortune from capturing prize ships while in the Navy, and had also served as a British envoy during the reign of Queen Anne. In 1718, he called on architect Sir John Vanbrugh to advise him on how to modernise and enhance the existing mansion. Upon viewing the site, Vanbrugh felt he could do nothing, and advised complete demolition of all except the ancient chapel near to the mansion, which is now the parish church of Our Lady. His advice was taken and the construction work was completed in 1728, two years after the death of the Admiral. The resulting new mansion was the last country house Vanbrugh designed, and it is regarded as his finest work. On completion, the Admiral's nephew Francis Blake Delaval (the elder) inherited the property, and moved in immediately. In 1775, the Newcastle portrait artist William Bell made two paintings of the Hall, depicting the north and south fronts. Bell also painted portraits of many of the residents of the house at the time, earning him the patronage of Lord Delaval, a younger son of the above-mentioned Francis Blake Delaval. These paintings can still be seen in the Hall today. In 1822, the central block was gutted by a fire said to have been caused by jackdaws nesting in the chimneys of the section of the south-east wing closest to the main house. This wing was subsequently demolished, and various openings can still be seen, now glazed, showing where it joined the central block. The house was partially restored by the architect John Dobson in 1862–63, when the central block was re-roofed, although it remained a shell internally. The effects of the fire remain clearly visible in the great hall, originally 30 feet (9.1 m) high but now open to the roof, with blackened walls and muse statues. During the Second World War the Hall was used to house German prisoners-of-war, who worked as labourers on neighbouring farms. Further restoration was completed in 1959 and the early 1960s, including replacement of windows in the central block, restoration of the upstairs gallery in the main hall, and paving of the floors on the piano nobile. However, the house was to remain unoccupied until the 1980s when, after a period of 160 years, Edward Delaval Henry Astley, 22nd Baron Hastings moved into the west wing. It became his permanent home until his death in 2007. Subsequently the new 23rd Baron Hastings, Delaval Astley, wishing to preserve the future of the Hall and encourage greater public access, began discussions with the National Trust. On 1 September 2008 the National Trust launched an appeal for £6.3m to bring the hall, with its gardens and grounds, into the Trust's custody. In December 2009, the Trust announced that its appeal had been successful, and the purchase having gone through, the Hall opened to visitors again on 1 May 2010. Central block drawn before completion, as Vanbrugh envisaged the house. The statues on the pediments were never executed. Engraving by Colen Campbell, from his Vitruvius Britannicus. The inside of the central block's main entrance. The stucco statues at first-floor level are permanently affixed to the walls; the missing ceiling was destroyed in the fire of 1822. The roof is modern. The style of architecture is known as English Baroque, based on the Palladian style introduced into the UK by Inigo Jones. Vanbrugh developed the style from the more decorated and architecturally lighter continental baroque popular in Europe. The design is of a centre block portico, or corps de logis, containing the state and principal rooms, between two flanking wings. The wings have a centre projection of three bays, crowned by a pediment, either side of which are 7 bays of sash windows above a ground floor arcade. The west wing originally housed secondary and service accommodation. Damaged in an earlier fire but restored to the original plan, it is distinguished by a great colonnade and boasted a lofty vaulted kitchen, now a salon. The east wing contains the stables, a sixty-foot chamber of palatial design, with stalls and mangers of stone fit. They were reportedly inspired by the stables at Hopetoun House, designed by Robert Adam. In 1768 Sir Francis Blake Delaval wrote thus to his brother: "I am putting up the grand stable on a plan we saw at Lord Hoptoun's when we were in Scotland, with stone divisions of the stalls." So pleased was he with the results that Sir Francis held a dinner party in the new stables. Between the two wings is a cour d'honneur, a great open courtyard 180 feet (55 m) long and 152.5 feet (46.5 m) broad. While the exterior is still a perfect example of English baroque at its finest, the interiors of the state rooms remain unrestored from the fire. Also in the 400 acres (160 ha) estate park is a stone mausoleum, about half a mile east of the hall, which once had a majestic dome, now gone, but which retains a portico resting on huge monolithic columns. The mausoleum is surrounded by a circular ha-ha, a stone-faced ditch. It was erected by Lord Delaval to his only son, John, who died in 1775 aged 19, "as a result of having been kicked in a vital organ by a laundry maid to whom he was paying his addresses". No-one was ever buried in the mausoleum, which was never consecrated, and the unfortunate John Delaval was buried in St Peter's Doddington, Lincolnshire. The mausoleum is now ruinous and its lead roof has gone. Also to the east in the walled garden is a south-facing orangery, designed by the architect William Etty, who collaborated with Vanbrugh. It has five glazed arches separated by Doric demi-columns. The statue in the forecourt in front of the house is a lead figure of David, with empty sling, lightly poised above the crouching form of Goliath, who has his thumbs doubled inside his palms. This is an 18th-century copy, possibly by John Cheere, of a 16th-century Italian marble by either Baccio Bandinelli or a follower of Giambologna. The statue has been repositioned from one of the corner bastions of the garden. A large obelisk commands the fields to the south of the hall; the stub of a second can be found on the north side of the road running past the hall, next to the turning for New Hartley. This second obelisk marked the site where Admiral George Delaval was killed in a fall from his horse in 1723, before his new hall had been completed. Only the pedestal of the obelisk survives, half-hidden by trees; it is uninscribed. From the steps of the house on a clear day, The Cheviot and Hedgehope Hill can be clearly seen on the northern horizon, some forty miles away on the Scottish border. Also visible to the northwest are the Simonside Hills. There is a first-floor window on the North front of Seaton Delaval where, so it would seem from one particular part of the forecourt, a white-clad figure is standing. This, according to legend, is the White Lady, a girl who fell in love with the Delaval heir and died of a broken heart because the marriage was forbidden. ^ Historic England. "Details from image database (236050)". Images of England. Retrieved 17 May 2009. ^ "William Bell paintings". BBC Your Paintings. Archived from the original on 24 September 2015. Retrieved 20 November 2013. ^ Tony Henderson (11 June 2014). "Historical twist as nesting birds hold up Seaton Delaval Hall work". journallive. Retrieved 6 December 2015. ^ "National Trust saves stately home". BBC News. 16 December 2009. Retrieved 16 December 2009. ^ Roger Burgess, Those Delavals! (1972), pp.26,27. ^ Seaton Delaval Hall: A Souvenir Guide (National Trust), pp.20-21. ^ Ian Robson (2 April 2015). "Secrets of the North East National Trust locations - Seaton Delaval Hall". nechronicle. Retrieved 6 December 2015. ^ Askham, F. (1955), The Gay Delavals, Jonathan Cape. Francis Askham was a pseudonym of Julia Eileen Courtney Greenwood. Wikimedia Commons has media related to Seaton Delaval Hall.